New York City is already home to many of the world’s greatest public spaces including Central Park, Prospect Park and of course, the High Line. So when Mayor de Blasio announced a set of initiatives to “reinvent the Brooklyn Strand” – a series of underutilized and disconnected public spaces and City-owned lots – a once-in-a-lifetime opportunity presented itself. This project will not only add another name to that accomplished list, but more importantly create a grand gateway befitting the County of Kings. 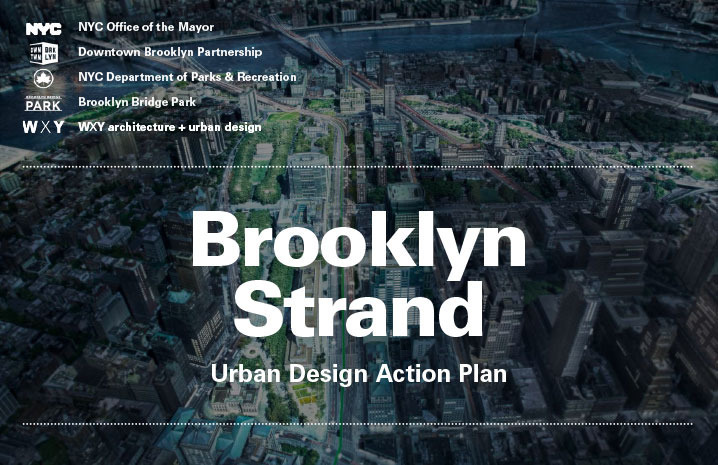 Over the past two years, residents, business leaders, elected officials, numerous City agencies – including the Department of Parks and Recreation and the Department of Transportation - and community groups - including Brooklyn Bridge Park among others, worked together to develop the Brooklyn Strand Community Vision Plan. All in all, more than 250 stakeholders took part, in the form of countless meetings, numerous public workshops, and 50 site walkthroughs. Led by WXY Architecture + Urban Design, this herculean effort has resulted in recommendations aimed at transforming the quality of public spaces in order to better connect Downtown Brooklyn, DUMBO, the Brooklyn Navy Yard, and surrounding neighborhoods while improving waterfront access. The following recommendations have been handed over to the City, now charged with determining which, if not all, of these recommendations can and will be set into motion to become a reality. While the Brooklyn Strand is still in a stage of infancy, the tremendous commitment and creative thinking from the community demonstrates the incredible opportunity to transform this space into the world-class gateway that Brooklyn deserves.